Four hosts on the TV morning show Good Morning Britain, took a MyHeritage DNA test. 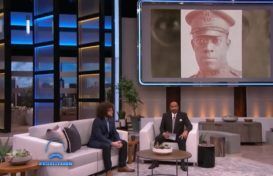 MyHeritage was invited on to the show to reveal the hosts’ results, and to discuss their ethnic origins and family histories. The hosts were inspired and surprised by their results. What is the most shocking thing you have learned from your MyHeritage DNA test? Let us know in the comments below. I was totally surprised to learn that I had some Scandinavian, Italian & Greek ancestry along with majority Jewish, East Europe…!